The Big Drop at Splash Mountain! Hi. it’s me: Sophie. You probably don’t remember me because I have not written on My Dreams of Disney in a long time. 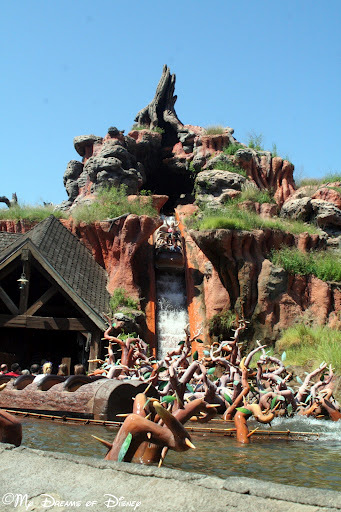 Today I’m going to do a review of Splash Mountain, which I have ridden at the Magic Kingdom of Walt Disney World! A few months ago back in October, my family and I went to Walt Disney World for the 40th Anniversary of the Magic Kingdom. There, my Dad convinced me to try Splash Mountain. I wasn’t so sure about it at first because of the fifty-two foot drop at the end. I was scared that I would go under the water! Even before the splash I freaked out. But not because of the splashy parts. Because of my dad’s hat! It fell off as we entered a scene where there were fake angry bees swarming around. It fell next to me and touched my hip. I thought it was an over-sized queen bee with an over-sized stinger. I was like “Ahhhhhhhhhhhh! It’s gonna sting me! Ahhhhhhhhhhhh! My mom was with me and I was squeezing her arm so hard I nearly broke it! Then I prepared to go under as we went to the top on the mountain then…”Ahhhhhhhhhhhh-splash! I realized I wasn’t even wet! Then I opened my eyes and my mom was drenched but we DIDN’T go under. I actually liked it. I liked it so much, that I convinced my dad to ride it TWICE with me next time we got the chance which is gonna happen next month! One thing I’m NOT gonna tell you is the story the RIDE tells (I already told you my tale.) You have to find THAT out on your own. So you’re gonna want to ride it. TTFN, Ta-Ta For Now! Previous Post: Disney in Pictures: Character Shots!